Hope, BC, Canada is, largely, a forested and mountainous rural community located on the eastern edge of the Fraser Valley and at the doorstep to backcountry wilderness. The community is situated at the confluence of the Coquihalla and Fraser Rivers and is surrounded by the looming Cascade Mountains. The rugged wilderness environment provides visitors many opportunities for year round adventures and outdoor activities. Top attractions, adventures and activities most enjoyed in and around Hope, BC, Canada and the surrounding areas are hiking, birdwatching, golfing, flightseeing, canoeing, kayaking, mountain biking, off roading, swimming, mountain climbing, horseback riding, road cycling, fishing, boating, water skiing, wind surfing, river rafting, picnicking, ice fishing, snowshoeing, snowmobiling and xc skiing. A few of the more popular, some would say best, activity destinations and sightseeing highlights located in and around Hope, British Columbia includes the Japanese Friendship Gardens in Memorial Park, Manning Park, Kawkawa Lake, Skagit Valley Provincial Park, Emory Creek Provincial Park, Lake of the Woods, Kettle Valley Railway Trail, Cascade Recreational Area, Mount Hope Lookout Trail, Nicolum River Provincial Park, Sasquatch Provincial Park and the Othello Tunnels. 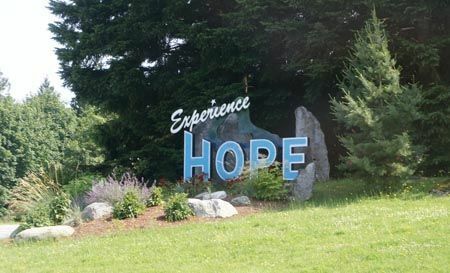 What are the Accommodations, Services and Amenities in Hope, BC? Hope places to stay, services and amenities important to travelers include accommodations (motels, inns, bed and breakfasts (B&Bs), vacation homes, cottages, lodges), campgrounds, tours, guides, outfitters, restaurants, laundromat, coffee shops, grocery store, pubs, liquor store, banks, gas stations, gift stores, and internet service. There are sightseeing attractions, historical sites, entertainment venues, and cultural events in and around Hope, British Columbia. Some of the top museums, art, entertainment, and cultural venues to visit includes the Hope Slide, Art Walk, and the Hope Arts Gallery. How Do I Get To Hope British Columbia? Hope is a major junction of highways. From Hope Hwy #1 splits into various routes including the Coquihalla Hwy (southern entrance), Highway #7 (Crowsnest Pass southern entrance), Hwy #3 (Princeton Hwy) and Hwy#5 (Hope Hwy). Other transportation services in the area of Hope includes taxi, train, aerodrome for recreational floatplanes, a private helicopter landing pad and the (YVR) Vancouver International Airport (1 hour 47 minute drive - 164 kms) and the BC Ferries Tsawwassen Terminal ( 1 hour 45 minute drive - 165 kms) and Horseshoe Bay Terminal (1 hour 45 minute drive - 172 kms). eh! Plan to Visit Hope, BC today.